The idea behind fixed fractional position sizing is that you base the number of contracts or shares on the risk of the trade. Fixed fractional position sizing is also known as fixed risk position sizing because it risks the same percentage or fraction of account equity on each trade. 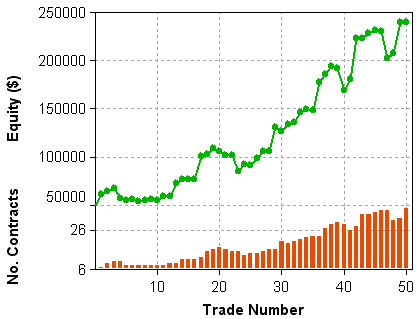 For example, you might risk 2% of your account equity on each trade (the “2% rule”). Fixed fractional position sizing has been written about extensively by Ralph Vince. See, for example, his book “Portfolio Management Formulas,” John Wiley & Sons, New York, 1990.
where N is the number of contracts, f is the fixed fraction (a number between 0 and 1), Equity is the current value of account equity (i.e., the value of account equity just prior to the trade for which you’re calculating N ),Trade Risk is the risk of the trade for which the number of contracts is being computed. The vertical bars ( | ) mean that we take the absolute value of the trade risk (risk is usually given as a negative number, so we make it positive). As an example, consider the series of trades below. The starting account size was $50,000. The profit/loss per contract is shown in the second column (“PL/Contr”). The next column is the trade risk — $320.28 in this case. The fixed fraction was 0.05 (5%). The next column shows the number of contracts computed according the equation above. 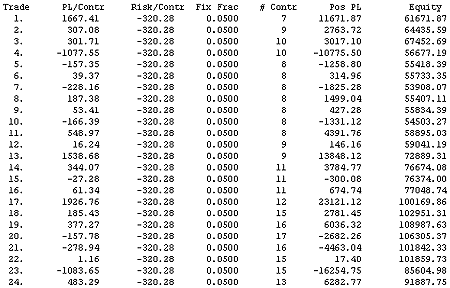 Multiplying the number of contracts by the profit/loss per contract results in the position profit/loss (“Pos PL”), which adds to the current equity value to give the new value of account equity, shown in the last column. O ptimal f position sizing extends the Kelly formula so that the wins and losses can all be different sizes. Optimal f calculates the fixed fraction that maximizes the rate of return for a given series of trades. While this sounds like a good idea, in practice the optimal f value (or the f value from the Kelly formula) often results in drawdowns that are too large for most people to tolerate.